Which recipe in SFTTSE have you been eyeing? Leave your nomination below and we might end up making it up for our second September recipe! Nominations will be open until September 5th. I’m starting to migrate the content from our Facebook “page” to a Facebook “group”. I’m hoping that this will allow for greater communication; no more posts being shunted off to the Siberia of the right sidebar! It’s time for our first fried rice recipe, and we’re keeping things tropical with a Jamaican flair to this recipe. Have any questions or comments about this recipe before you start? Tip: I make fried rice on an almost-weekly basis, and I learned pretty quickly that in order to have a successful fried rice you need to follow Grace’s advice and use day-old, cold rice. Make your rice the day before you plan on using it, fluff it, and store it in the fridge overnight. 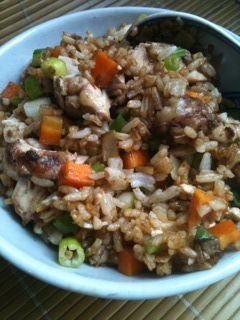 Read “Fried Rice: The Stir-Fry for Rookies” on p. 257 of SFTTSE for more information. Most people keep red pepper flakes for years. If it’s not fresh you’ll need more than the 1 tsp called for. If you don’t like dark meat you can substitute chicken breast. Be sure to cook the rice the day before and fluff. This will make the rice easier to stir-fry. If there is one ingredient that tends to show up time and again in stir-fry recipes its scallions. Personally I love scallions, but oftentimes when the recipe calls for the thinly shredded scallions that are a staple of many stir-fry dishes, I wimp out and just roughly chop them. 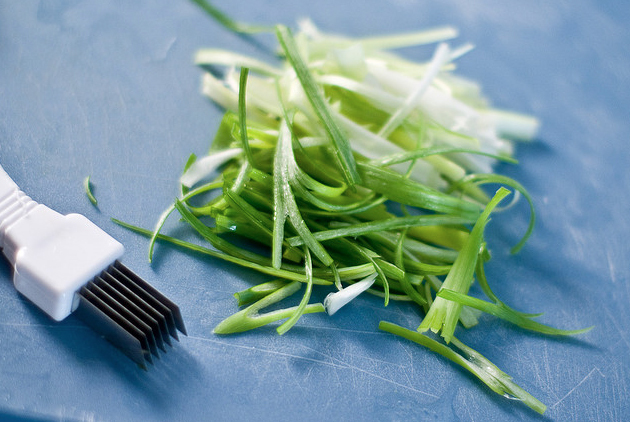 Luckily for us some enterprising genius came up with the negi cutter, a nifty and easy way to quickly and uniformly shred scallions. It’s also handy for asparagus, leeks, and other veggies. Would you make a non-Asian stir-fry (ie. 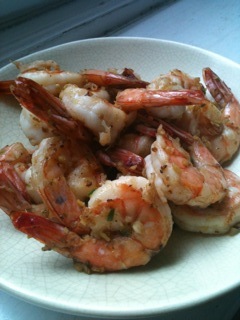 shrimp scampi stir-fry)? Do you feel stir-fry has to be Asian or do you like the idea of stir-fries with Mediterranean, Latin, or even Caribbean flavors? Can the aromatics be garlic, shallots, or onion (rather than ginger, scallions, and chilies) and be seasoned with chopped basil and wine (rather than cilantro and rice wine)? Tell us what you think. A winner will be chosen at random and will find him or herself the proud owner of a new negi cutter! Another Wednesday, another wok adventure! Leave a link below to your blog post or a comment letting us know what you thought! You can also join in the conversation on the Wok Wednesdays Facebook page.